NMR structure of Contryphan-Vn. The peptide backbone is depicted by a curved tube while the amino acid side-chains are represented by capped sticks. Carbon atoms are colored grey, nitrogen atoms blue, oxygen atoms red, and sulfur atoms yellow. The contryphans (conus + tryptophan) are a family of peptides that are active constituents of the potent venom produced by cone snail (genus conus). The two amino acid cysteine residues in contryphans are linked by a disulfide bond. In addition, contryphans undergo an unusual degree of post-translational modification including epimerization of leucine and tryptophan, tryptophan bromination, amidation of the C-terminus, and proline hydroxylation. and the remainder of the letters refer to the standard one letter abbreviations for amino acids. The venom of cone snails cause paralysis of their fish prey. The molecular target has not been determined for all contryphan peptides, however it is known that contryphan-Vn is a Ca2+-dependent K+ channel modulator, while glacontryphan-M is a L-type calcium channel blocker. ^ PDB: 1NXN​; Eliseo T, Cicero DO, Romeo C, Schininà ME, Massilia GR, Polticelli F, Ascenzi P, Paci M (June 2004). "Solution structure of the cyclic peptide contryphan-Vn, a Ca2+-dependent K+ channel modulator". Biopolymers. 74 (3): 189–98. PMID 15150794. doi:10.1002/bip.20025. ^ a b c Hansson K, Ma X, Eliasson L, Czerwiec E, Furie B, Furie BC, Rorsman P, Stenflo J (2004). "The first gamma-carboxyglutamic acid-containing contryphan. A selective L-type calcium ion channel blocker isolated from the venom of Conus marmoreus". J. Biol. Chem. 279 (31): 32453–63. PMID 15155730. doi:10.1074/jbc.M313825200. ^ a b Jimenéz EC, Olivera BM, Gray WR, Cruz LJ (1996). "Contryphan is a D-tryptophan-containing Conus peptide". J. Biol. Chem. 271 (45): 28002–5. PMID 8910408. doi:10.1074/jbc.271.45.28002. ^ Jimenez EC, Craig AG, Watkins M, Hillyard DR, Gray WR, Gulyas J, Rivier JE, Cruz LJ, Olivera BM (1997). "Bromocontryphan: post-translational bromination of tryptophan". Biochemistry. 36 (5): 989–94. PMID 9033387. doi:10.1021/bi962840p. ^ a b c d e Jacobsen R, Jimenez EC, Grilley M, Watkins M, Hillyard D, Cruz LJ, Olivera BM (1998). "The contryphans, a D-tryptophan-containing family of Conus peptides: interconversion between conformers". J. Pept. Res. 51 (3): 173–9. PMID 9531419. doi:10.1111/j.1399-3011.1998.tb01213.x. ^ a b Massilia GR, Schininà ME, Ascenzi P, Polticelli F (2001). "Contryphan-Vn: a novel peptide from the venom of the Mediterranean snail Conus ventricosus". Biochem. Biophys. Res. Commun. 288 (4): 908–13. PMID 11688995. doi:10.1006/bbrc.2001.5833. ^ Jacobsen RB, Jimenez EC, De la Cruz RG, Gray WR, Cruz LJ, Olivera BM (1999). "A novel D-leucine-containing Conus peptide: diverse conformational dynamics in the contryphan family". J. Pept. Res. 54 (2): 93–9. PMID 10461743. doi:10.1034/j.1399-3011.1999.00093.x. Conotoxins are small snail toxins that block ion channels. Cone snail toxins, conotoxins, are small neurotoxic peptides with disulphide connectivity that target ion-channels or G-protein coupled receptors. Based on the number and pattern of disulphide bonds and biological activities, conotoxins can be classified into several families [PUBMED:11478951]. Omega, delta and kappa families of conotoxins have a knottin or inhibitor cysteine knot scaffold. 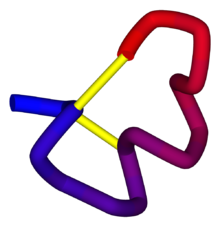 The knottin scaffold is a very special disulphide-through-disulphide knot, in which the III-VI disulphide bond crosses the macrocycle formed by two other disulphide bonds (I-IV and II-V) and the interconnecting backbone segments, where I-VI indicates the six cysteine residues starting from the N terminus. The disulphide bonding network, as well as specific amino acids in inter-cysteine loops, provide the specificity of conotoxins [PUBMED:10988292]. The cysteine arrangements are the same for omega, delta and kappa families, even though omega conotoxins are calcium channel blockers, whereas delta conotoxins delay the inactivation of sodium channels, and kappa conotoxins are potassium channel blockers [PUBMED:11478951]. Mu conotoxins have two types of cysteine arrangements, but the knottin scaffold is not observed. Mu conotoxins target the voltage-gated sodium channels [PUBMED:11478951], and are useful probes for investigating voltage-dependent sodium channels of excitable tissues [PUBMED:2410412]. Alpha conotoxins have two types of cysteine arrangements [PUBMED:1390774], and are competitive nicotinic acetylcholine receptor antagonists. For those sequences which have a structure in the Protein DataBank, we use the mapping between UniProt, PDB and Pfam coordinate systems from the PDBe group, to allow us to map Pfam domains onto UniProt sequences and three-dimensional protein structures. The table below shows the structures on which the Conotoxin domain has been found. There are 33 instances of this domain found in the PDB. Note that there may be multiple copies of the domain in a single PDB structure, since many structures contain multiple copies of the same protein sequence.